The monsoon flow has begun here in Colorado and with the wide open vistas we enjoy around Salida rain events like this are a daily occurrence. 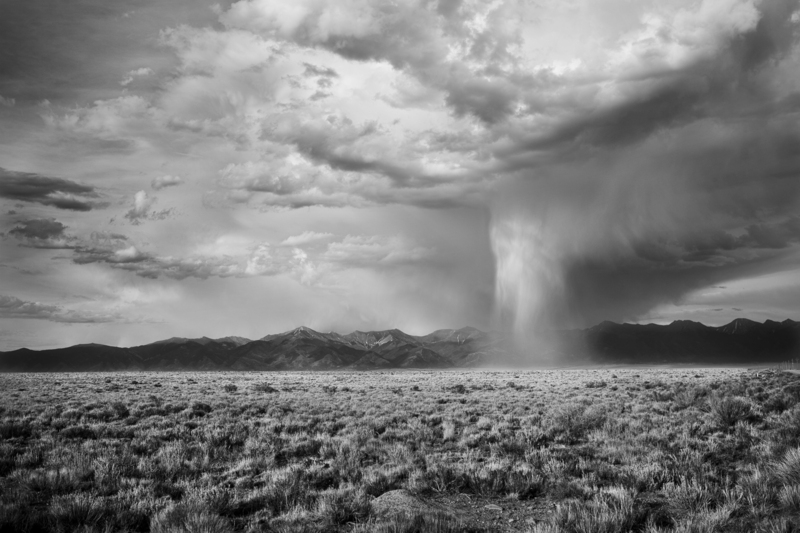 On this particular day, I was driving home from a photo shoot at the Great Sand Dunes National Park and saw this thunder head growing near the small town of Villa Grove which lies at the northern end of the San Luis Valley. The Sangre de Cristo mountains in the background start just north of here and run south towards Taos, New Mexico. That chain of mountains has intrigued me for years as I’ve made many pilgrimages to and from New Mexico chasing the light. But as luck would have it I was in the right place and headed into the storm with enough time on my hands to shoot this amazing display.